We believe children learn and develop skills and confidence through active engagement with their environment and each other. Children are encouraged to explore activities and materials at their own pace which have been planned to stimulate each of the five developmental areas (social, emotional, physical, language and cognitive). It is our goal to create a nurturing environment where a child’s natural love of learning will thrive. Each teaching team plans weekly curriculum to create developmentally appropriate plans that focus on the developmental needs of the individual children, as well as the group, and that are embedded in the children’s interests. We desire to partner with you regarding your child’s care and education. Please take the time to review the weekly curriculum plan which is sent home. Registration fees are non-refundable. Enrollment in the Preschool for July 2017-June 2018 requires a $400 registration fee. Families may opt out for the months of July and/or August. If enrollment is for July and/or August only, $50 registration fee is required (see Registration Form and Paragraph 3 of the Tuition Agreement). *For more information about tuition, see the Tuition Agreement. 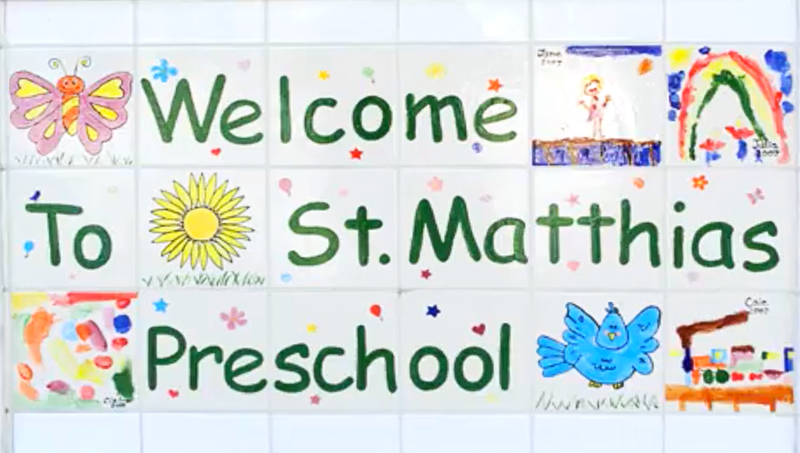 If more than one child per family is enrolled at St. Matthias Preschool, a $200 per month tuition discount will be applied to the family tuition statement each month (see Paragraph 2 of the Tuition Agreement). Pay by Check: Tuition checks are placed in the file box labeled “tuition” on the sign-in desk. Please do not place them on the secretary’s desk. Please put your child’s name in the memo field of the check. Tuition checks are deposited on Monday mornings. There is a $25 returned check fee for checks that are returned to us from the bank due to insufficient funds. Pay by Credit Card: Families can pay their tuition via credit card by visiting www.stmatthiasparish.org — Go to Support Us, then Online Donations. At the bottom of the form, there are options to pay Preschool Tuition, Registration Fees and to make donations to the Preschool Opportunity Fund. Alternatively, a Vanco Form can be completed for automatic payments. (Vanco is the credit card processing company used at St. Matthias). Forms are available by request. Payments will be processed automatically on the 1th and/or 15th of the month pursuant to your selection on the Tuition Agreement. Children can be refused admittance if tuition becomes delinquent.